A quiet day on the 8th. Migration watch; 08.05 – 11.25hrs and 19.00 – 20.20hrs. On the move (north unless stated) were 11 Canada Geese south, 25 Common Scoter + 1 south, 2 Manx Shearwater, 9 Cormorant, 2 Sandwich Tern + 16 south, 23 Puffin and 3 Swift. The only reports were of 3 Shelduck, 2 Dunlin, a Lesser Black-backed Gull and 35 Great Black-backed Gull were on Scalby Lodge Pond and 5 Grey Heron were on Johnson’s Marsh. A slightly more active day on the 9th. Migration watch; 18.33 – 19.33hrs. On the move south were 1 Lesser Black-backed Gull, 2 Sand Martin, 3 Swallow, 3 House Martin, 2 Linnet and 3 Goldfinch. with a Red Kite seen heading north over Crossgates and later over Scalby. 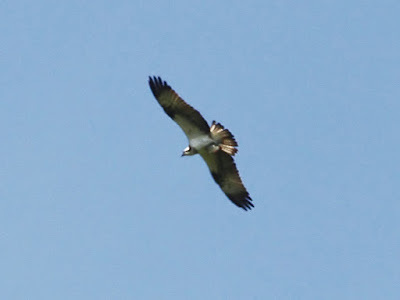 A Red Kite was also seen again up over Wykeham Forest as were 3 Honey Buzzard and an Osprey. On Johnson’s Marsh there were 9 Grey Heron and a drake Wigeon.